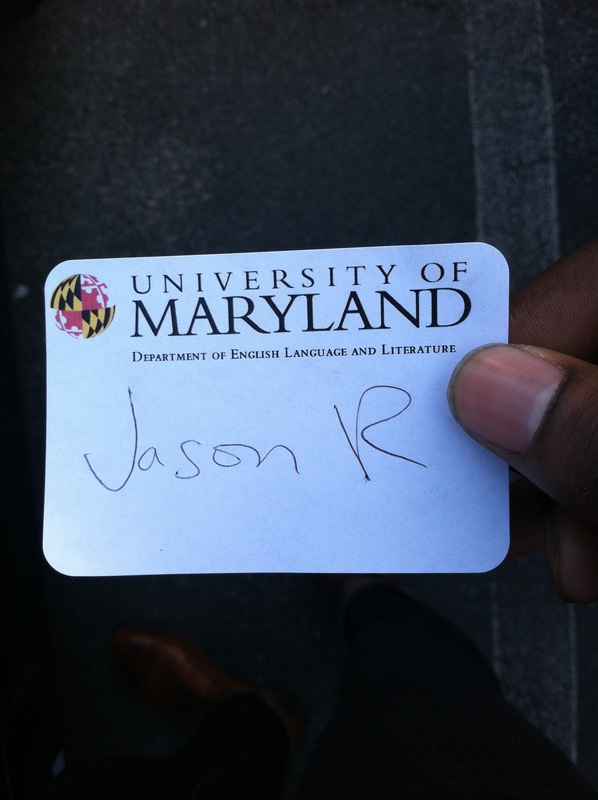 I had the amazing opportunity to speak at University of Maryland’s, English Department’s Alumni Luncheon, this past Saturday, and I have to say, it goes up there with speaking at the Kennedy Center for me. I’m sure some people are scratching their heads wondering how the hell speaking to some of my former professors could rank up there with speaking at one of the most prestigious theaters in the world. And to those people I’d say that I wouldn’t have ever gotten to the Kennedy Center stage if it wasn’t for some of these professors. It was an honor to be amongst them and be respected as a professional — a peer. I was able to tell them a bit about my discouragement while in the program, while also thanking them for the support, the example, and most importantly, the opportunity to learn and grow as a teenager with an angst-filled chip on his shoulder. I told the story of my experience with Professor Ted Leinwand, a Shakespeare scholar who had a thing for dry humor, and a disdain for bad writing. This guy used to edit our emails. EMAILS! I hope you’re still practicing. Did I quit? Thought about it. But that chip on my shoulder wouldn’t let me. Or maybe it was the voice within. The unknown, unnamed, “thing.” But I was definitely shaken, and some of the walls of my confidence were cracked, made brittle by the brutal Professor Leinwand. There is much to be proud of here. And that was it. I explained to my professors at the luncheon, that I’ve held on to that sentence for ten years. It was a turning point in my life because though Professor Leinwand didn’t come right out and say it, I always took that sentence as “You’re getting better,” and that’s all I needed to know to really go after this writing thing — this dream. So thank you Professor Leinwand. Thank you University of Maryland. This is an amazing accomplishment! J, I remember when you had it out with an English teacher too. I believe it was a creative writing professor who didn’t like your “style”. One thing you taught me in your actions was to fight for your individuality. No matter what your professors are teaching you, still maintain some semblance of yourself in your practice. I was an engineering major turned manager (out here in the real world) and I don’t manage people and projects by some textbook’s standards all the time. I manage it all with a little bit of my own style that works for me. Kudos to you!! And, yes I still have both of those books haha! oh, oh prof. Leinwand – whatta guy.